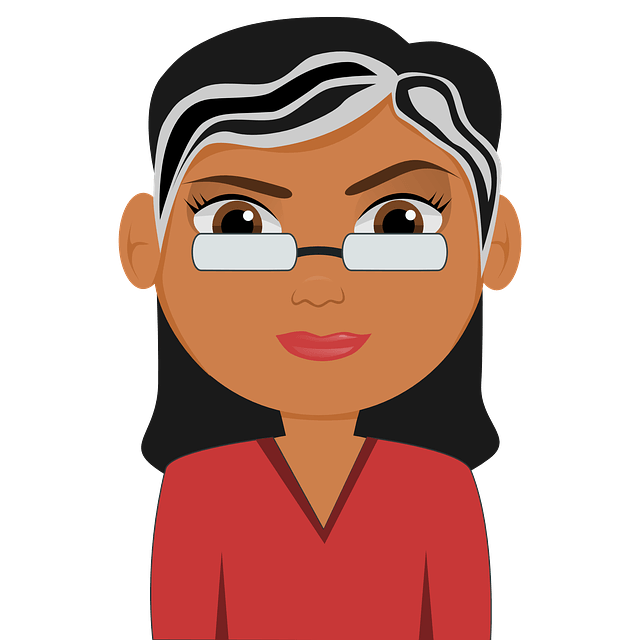 1 How Probiotics Help With Constipation? 2 Probiotics for constipation: Which species work best? 6 Can probiotics cause constipation? Constipation is becoming an increasingly common health issue in industrialized societies mainly due to the over dependence on processed and packed foods and high-sugar low-fiber diet. Constipation affects approximately 15 to 25% of the population but most of the times, people don’t even realize they have constipation until irregular bowel movement or difficulty in passing stool becomes a regular problem. While there are various causes of constipation the main question is how to treat constipation? Doctors usually prescribe laxatives to relieve constipation, but it’s only a short term cure. Using laxative over an extended period of time often leads to laxative dependence, electrolyte imbalance and dehydration. But there are a number of studies which show that probiotics can be used to treat constipation without causing any side effects. So, how probiotics help with constipation? Which is the best probiotic for constipation? In this article we have addresses all these queries and rounded up a list of some of the best probiotics for constipation. How Probiotics Help With Constipation? Before getting on with how probiotics help relieve constipation, it must be understood that they are not a magic bullet for curing constipation. A lot of factors go into maintaining digestive regularity, such as following a balanced and healthy diet rich in dietary fiber and whole foods, drinking plenty of water every day and staying moderately active. Probiotics are live microorganisms that improve the balance of intestinal flora and help to relieve constipation and other digestive disorders such as diarrhea, Irritable Bowel Syndrome, Inflammatory Bowel Disease, etc. Our intestine is home to billions of bacteria which includes both ‘good’ and ‘bad’ bacteria. Various factors such as taking antibiotics or following a low-fiber high-sugar diet can lead to an imbalance (dysbiosis) of the good and bad bacteria in the gut which in turn leads to digestive disorders such as constipation. First, probiotics aid digestion and improve the absorption of nutrients from foods. The enzymes released by the probiotics are extremely beneficial for the digestive system. Secondly, probiotics create barrier against pathogens and bad bacteria by creating a coating over the linings of the gastrointestinal tract and preventing the colonization of bad bacteria and microorganisms. Thirdly, probiotics restore the balance of microflora in the digestive tract and relieves symptoms such as constipation, diarrhea, food intolerance, allergies, etc. Lastly, some probiotics are capable of producing lactic acid and short-chain fatty acids from prebiotics that help to lower the pH of the intestine. This in turn promotes muscle contractions in the colon and improves bowel regularity. A study published in the American Journal of Clinical Nutrition was conducted by the Researchers at King’s College in London. The researchers found 14 studies all of which were clinical trials that assigned people with constipation to take either a probiotic or a placebo. By comparing the findings of the trials it was seen that on an average probiotics slowed down gut transmit time by 12.4 hours and increased the number of weekly bowel movements by 1.3. It also helped to soften the stool, thus making it easier to pass. Probiotics containing Bifidobacterium appeared to be the most effective. Another study involving children with constipation was published in the Nutrition Journal. In this study 20 children aged 4-16 experiencing constipation were given a probiotic mixture on a daily basis for a period of four weeks. It has seen that many children had more frequent bowel movements when taking the probiotic mixture. Dr. Mark Benninga from the University of Amsterdam studied a group of 20 preganant women experiencing constipation symptoms. The women were given a probiotic supplement for 4 weeks. It was seen that their average number of bowel movements per week increased from 3 to 6. Probiotics for constipation: Which species work best? 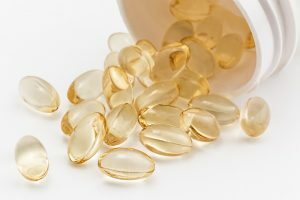 One important thing to notice about research and studies on probiotics for constipation is that there is no one particular probiotic species that is able to provide relief from constipation. It always takes a combination of different species and strains of microbes to maintain a healthy digestive system. What works as an effective probiotic for constipation for one person may not have same results for another person having similar complications. Most of the bacteria that live in our large intestine belong to the Bifidobacteria and Lactobacillus species. So, taking a probiotic supplement that contains specific strains from these 2 species can help to promote bowel regularity and relieve constipation. This strain of probiotics lives in the colon and is extremely beneficial for constipation considering the condition occurs in the colon. Bifidobacterium lactis BB-12 is one of most well researched strains that have been through several trials for constipation and it has been seen that it can relieve constipation even in IBS patients. Bifidobacterium lactis DN-173 010 is another important strain that has been tested several times. It was used for the largest double-blind study on 267 patients with IBS-C. After 6 weeks of use it was seen that the patients experiences significant increase in stool frequency. But, while the results for adult candidates were positive, a double blinded trial with constipated children wasn’t effective. This shows that the Bifidobacterium lactis DN-173 010 strain is less effective for constipation in children. This shows how not every probiotic strain is useful for everyone. Lactobacillus casei rhamnosus GG, also known as LGG is a widely researched strain of bacteria that has proven health benefits, but in case of reducing constipation, the results are mixed. A pilot study that tested a combination of Bifidobacterium bifidum, B. infantis, B. longum, Lactobacilli (L.) casei, L. Plantarum and L. rhamnosus was seen to increase bowel movements in constipation patients. But a later study in which LGG was administered to constipated children who had been taking lactulose did not show any positive results. This shows that LGG may not have significant benefits in the treatment of constipation and may be more studies are required on LGG alone to access its benefits. Another study carried out on Lactobacillus casei rhamnosus Lcr35 (a different strain) showed that it reduced chronic constipation in children more effectively compared to magnesium oxide. In a double-blind parallel study conducted on 70 healthy adults, the candidates were given a combination of 375g of milk fermented with the specific B.animalis strain DN-173 010 daily for 11 days. It was seen that it reduced colon transit time by 20%. But the effect was more prominent among women. So, another study was conducted to confirm the benefits of B.animalis DN 173 010 in reducing transit time in people suffering from constipation. These strains of this species were mostly tested in small studies, but almost all the tests had positive results. In a controlled trail of 636 patients suffering from constipation dominant IBS, it was seen that taking a combination of Bifidobacterium longum W11 with the prebiotics FOS (Fructooligosaccharides) improved stool frequency and consistency. This species has become extremely popular for relieving IBS symptoms. Trials conducted using the strain L.plantarum 299v showed that it is helpful in reducing discomfort and abdominal bloating associated with IBS, but it is not specifically useful for relieving constipation. However another double blind randomised trial involving strains L.plantarum SN13T and L.plantarum SN35N on 68 healthy adults having constipation symptoms showed that they were effective at reducing the symptoms and improving liver function. This is one of the main species of bacteria found in the healthy gut flora of infants along with Bifidobacterium bifidum. These are the most important and beneficial microorganisms found in infants and children during the early years. In a study conducted by Whorwell it was seen that bacteria strain B.Infantis 35624 promoted more frequent bowel movements in children than those who were given a placebo. This bacteria strain is commonly found in probiotic-enriched yogurt drinks. In a controlled blinded trial, 70 patients with chronic constipation were given either a Lactobacillus casei shirota treated yogurt drink or a placebo. After 2 weeks it was seen that the patients treated with the yogurt drink had sharply reduced constipation. 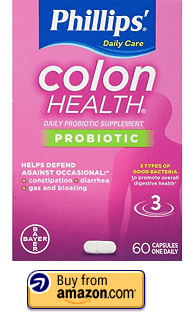 With a combination of three different probiotics and magnesium, Phillips Colon Health Probiotic Capsules is one of the best probiotic supplements for improving all kinds of digestive disorders. This supplement contains a combination of Lactobacillus gasseri KS-13, Bifidobacterium bifidum G9-1 and Bifidobacterium longum MM-2 that helps to relieve constipation, diarrhea, gas and bloating and helps to replenish good bacteria in the digestive tract. It also contains mineral magnesium that helps to soften stool and ease its passing by attracting water to the stool. The supplements are blister-packed which helps to maintain the freshness and potency of the probiotics and makes them easy to swallow. 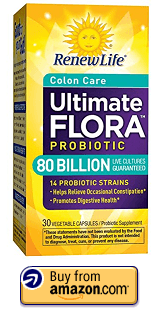 This is a potent vegan probiotic supplement that contains 5 specially selected Lactobacillus and Bifidobacterium strains that relieves constipation and other digestive issues. It also helps to re-colonize the small intestine and restore healthy balance of intestinal flora. Each serving of this supplement contains 30 billion CFUs of good bacteria, which is almost double of other probiotic supplements. Each batch of this probiotic supplement is 3rd party tested by an independent laboratory to ensure its safety, strength and purity. This probiotic supplement is completely vegan, gluten-free and non-GMO and it does not require refrigeration, so you can carry it while travelling. The capsules are blister sealed in order to ensure their stability and potency till the date of expiry. However, it is worth considering that each serving of this supplement provides 30 billion CFUs of bacteria which might be a bit high for regular use. 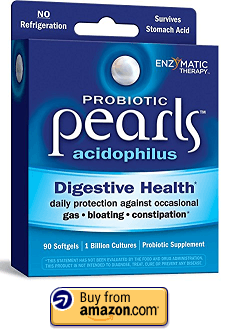 This is an acidophilus supplement that comes in easy-to-swallow pearl form with triple layer coating that survive even the harshest stomach environment. Each serving of this supplement provides 1 billion CUFs of Lactobacillus Acidophilus and Bifidobacterium Longum that supports healthy digestion and intestinal function. In addition, it also helps to maintain healthy yeast balance in the body. The specially designed pearls come with triple-layer coating that does not dissolve till it transport the live cultures safely to the intestines. 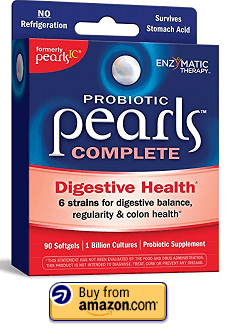 The pearls also protect the probiotics against light, oxygen and moisture which makes it a shelf stable product that does not require refrigeration. This supplement is absolutely free from gluten, salt, yeast, wheat, artificial colors, artificial flavours and preservatives. But it does contain fish and milk proteins and soy lecithin which makes it unsuitable for vegans, vegetarians and people with lactose intolerance. This is a distinctive probiotic supplement developed by award-winning microbiologist Iichiroh Ohhira that contains a combination of 12 strains of lactic acid bacteria (LAB). The speciality of this supplement lies in the prolonged fermentation of these bacteria. The bacteria go through a 3-years long fermentation process that promotes the survival of the strongest bacteria. It also makes it a shelf-stable supplement that does not require refrigeration. This supplement contains biogenic ingredients that support each individual’s unique probiotic “fingerprint”. The probiotics are encapsulated with their natural culture medium (prebiotics) of fermented vegetables, fruits, seaweed and mushrooms that nourish the bacteria. This supplement is a complete probiotic system that contains probiotics, prebiotics, enzymes, micro-nutrients and organic acids that support healthy digestion, improves nutrient absorption and boost metabolism and immune response. This is a 100% vegetarian product; free from gluten, dairy, GMO and chemicals. 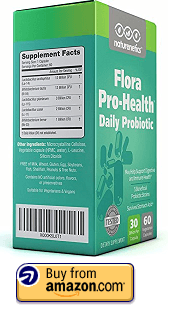 This is a high potency RAW probiotic formula that supplies 50 billion CFUs of beneficial bacteria per serving and contains a combination of clinically studied strains of Lactobacillus acidophilus and Bifidobacteria. These species are especially beneficial for improving digestion, supporting colon health and promoting regular and healthy bowel movements. This supplement also contains a combination of 17 different digestive enzymes that improve nutrient absorption. This product is 100% vegetarian, gluten-free, soy-free and non-GMO. It does not contain any fillers, binders or carriers. But this supplement needs to be refrigerated to maintain the potency of the live cultures. This is yet another useful probiotic supplement from Enzymatic Therapy that combines 4 Bifidobacterium and 2 Lactobacillus strains and provides a total of 1 billion CFU per serving. The combination of these beneficial strains helps to improve colon health, support digestive balance and promote regularity. The supplement comes in the form of easy-to-swallow pearls with True Delivery Technology which ensures that the active cultures survive the stomach acids and reach the intestine alive. The triple layer coating of the softgels protects the probiotics from heat, air and moisture and makes it a shelf stable product that does not require refrigeration. This supplement is free from yeast, wheat, corn, artificial colouring, artificial flavourings and preservatives. But it does contain fish protein and minimal amount so residual milk protein, so it’s not suitable for vegans and vegetarians. This is one of the most potent probiotic supplements in this list that supplies 80 billion liver cultures per capsule that provides quick relief from your digestive issues. This supplement contains 14 different scientifically studied probiotic strains of Bifidobacterium and Lactobacillus that promote digestive health and helps to relieve constipation. 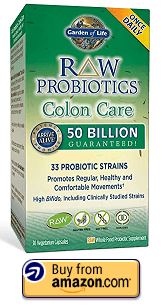 Each serving of this supplement provides 80 billion live cultures to the intestine. This supplement does not contain any artificial ingredients and is absolutely gluten-free, dairy-free and soy-free. The supplement is manufactured in a GMP facility and the quality, purity and potency of the supplement is guaranteed through expiration. Our gut microbiome consists of a wide variety of bacteria and each one of us has a unique composition for different species of bacteria. So, a probiotic supplement that works for one person may not show equally effective results for another person. So, it is best to look for a few basic features when choosing a probiotic supplement. If you are looking for fast results then it is best to choose a probiotic supplement that has an innovative formulation with the highest number of CFUs per serving so that you start seeing results in just a couple of days. Also, if the supplement you choose contains other micronutrients or enzymes, then make sure the percentage of each of the nutrients is specifically stated in percentage. Although, all probiotic supplements claim to have billions of microorganisms in each serving, there is no way to determine how many of them are still alive when you consume them. However, most reputed manufacturers send their supplements to independent labs for testing and verification which helps to evaluate the quality, purity and potency of the supplements. It is important to check the list of ingredients carefully before purchasing any supplement to make sure it does not contain any harmful elements. It is best to avoid probiotic supplements that contain preservatives, fillers, binders, blenders and chemicals. Formulations that use these elements can cause serious health issues. It is recommended to opt for a probiotic supplement that is as natural as possible. Most of the reputed brands produce their probiotic supplements in GMP and FDA certified labs. Probiotics manufactured in certified labs undergo special process that ensures the effectiveness of the product. It is best not to buy a supplement that does not mention its manufacturing details. If you come across a probiotic supplement that offers unconditional money-back guarantee then in all probability it is a high-quality product and the manufacturing company really stand by the efficiency of the product. The best way to know whether a particular probiotic supplement will work for you is by testing it yourself. It is an extremely easy and simple process. All you need to do is start monitoring the changes you experience once you start taking the supplement. Current Bowel Activity Level – Daily movements (if any), size, etc. Over all health status – Take note of any health issues such as fever, headaches, allergies, etc. Time of taking the supplement – Make a note of when you are taking the supplement – before or after a meal, during breakfast, lunch or dinner, etc. Track these things for a couple of months and then analyze the notes and you will be able to decide whether you are making any progress with a particular probiotic supplement or not. Although, there are a lot of articles on the internet which claim that probiotics can cause constipation, but when it comes to science backed evidence, no existing medical research suggests that probiotics can cause or lead to constipation. Not all probiotic supplements are created equal and an added concern is that probiotics are not regulated by the FDA (Food and Drug Administration) so it is best to look through the health claims that the manufacturers make and choose a product that meets your specific needs. We have also researched some other home remedies to treat constipation using olive oil, blackstrap molasses, etc in separate posts. Help!! 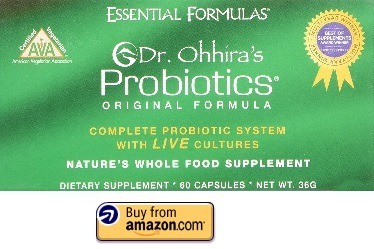 I have tried several probiotics and I have been taking more than 1 per day. I probably take 3-4 every day without any relief in constipation. I used to have 1 bowel movement per day without any problems, now it is impossible to have one every 3-4 days. Trying to find the best probiotic or something to help me to be normal again.